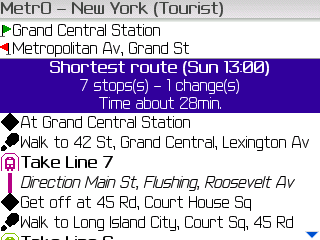 After a long wait, Métro for the BlackBerry has been released. This page will guide you through its installation and use. The current version of the program will run only on BlackBerry devices with OS version 3.6.0 or later. A color screen is highly recommended (you would miss a lot of information on a b&w screen). If your BlackBerry has a removable memory card, you will be able to copy the city databases directly on the card. If not, a functioning network connection is required to search and download the city databases needed to run the program. In both cases, please read the instructions below to load the city files. Before using Métro , you should read our license agreement. If you don't agree with the terms of this license, you MUST NOT download the software and you MUST delete any copy that may be in your possession. 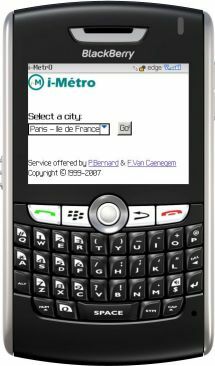 To install Métro on your device, just point the BlackBerry web browser to http://metro.nanika.net/MetroBB.php (the case is important!) and follow the installation instructions. For a desktop installation, you can download the MetroBB.zip package and follow the instructions provided in the included "readme.txt" file. 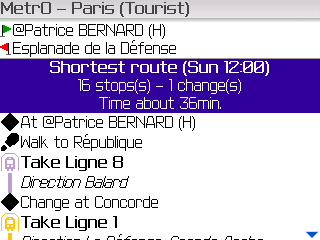 Métro is also available on the BlackBerry App World. To find the app, search "kinevia" in the store or click on the image above. 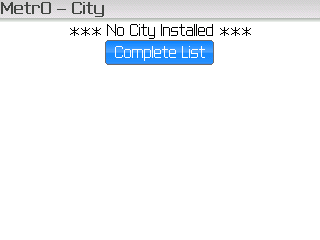 When first starting the program, the city list is displayed and it will probably be empty: a message will tell you so. All features in the program are accessed through menus. Access the menu now on your device and you will have one important function available: "Complete List". Select this option to access the list of available cities on our servers (again, a network connection is necessary for this to work). When the list is empty, a button also lets you quickly load the server list. 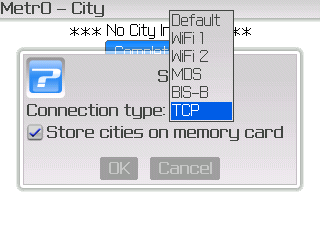 Note: if you have a removable memory card in your BlackBerry, you may also directly copy the city databases in the "metro" (all lowercase) directory under the root of the card (copy the individual ".pdb" files corresponding to the cities you are interested in, not the full ".zip" file). You can use all the files from the Métro "standard" package. Whenever the program may take a long time to process a command, a pop-up window will tell you to be patient. This is not blocking any other task on your Blackberry, especially if you receive a call. The program always gets its data from our servers. This ensures that you always have access to all the cities available, wherever you are, and that the data is up to date. In case you wonder, we do not use or store any personal data coming from your BlackBerry. If you receive an error when trying to connect, it may be worth checking the "Setup" option. It will also be helpful if you want to tweak the connection mode (e.g. forcing the use of a WiFi network). Use any of the "WiFi" options if you want to force a connection trhough WiFi. Use the "MDS" option if you have an MDS server on your BES (your enterprise network administrator should know that) and the "Default" option does not work. Use the "BIS-B" if you are using a "personnal" BlackBerry (not attached to an enterprise server) and you have a specific BlackBerry data plan with your wireless carrier. Use the "TCP" option if you have a "regular" data plan with your carrier. In that case, you will have to check your "TCP" settings (under "Options" or "Options -> Advanced Options", depending on the system version). Contact your carrier for help or have a check at this list for common parameters. Please note that using such a configuration may incur specific charges from your carrier. These options have been reported to work in most cases. However, there still may be configurations that are not handled well. Please send us a detailed report if you cannot connect even after trying out all these options. This configuration screen also lets you, if your BlackBerry supports the feature, specify that the city databases are to be installed on a memory card. If you check this option, all the files you download (new and updated) will be copied on the card, if one is accessible..
After getting the information from our servers, a list of all cities available for Métro is displayed. A "flash" icon helps you remember the file is on the server and must be downloaded before you can use it (vs. a file that has been saved on your device). At the moment, the program supports only files encoded in a standard ASCII charset. Support for other charsets may be added in the future.. 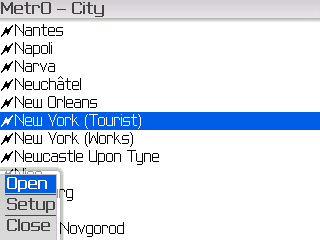 Select the city you want to use (you may enter the first characters of its name to scroll faster) and access the menu: you can see a new option to "Open" the city. Now, loading the city can take a while, especially if you have low bandwidth on your network connection. Yes, once again, a network connection is necessary to get a city file. However, from this point, no connection will be needed anymore (unless you want to download other cities). The files are stored locally on your device and you can access any city you have previously loaded without accessing a server. 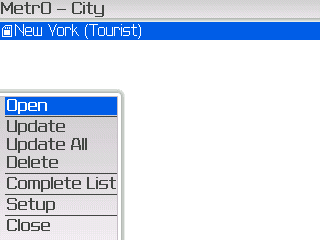 You can return at any time to the city list, with the "City" option of the main screen menu. It will display the cities you have installed. A specific icon shows the files present on a memory card (as in the screenshot). "Delete" to remove a file present on your device. "Update" to search for and, if necessary, install a new version of the selected city. "Update All" to search for and, if necessary, install new versions of all the databases present on your BlackBerry. If everything went well with the city loading, you should be taken back to the program main screen, and the window title shows the name of the city you have opened. To search a route, you have to provide your start and end stops. You may simply enter the stop names in the fields at the top of the screen (marked with green and red flags). You don't have to bother with special characters and accents (and even spaces): the program will recognize stop names all the same. You can use the "enter" key to switch from the departure to the arrival field and next to run the search (or use the "Go!" option in the menu). If you are not sure of the stop names, the "Stops" option in the menu will help you select them in a complete list. 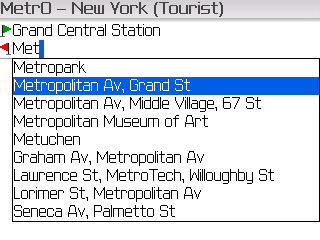 The "Stops" screen displays a complete list of stops available in the current city database. Places of Interest (PoIs) are also included, displayed in bold. As with most lists, you can type the first letters from a name to scroll faster. When you have found your stop (and selected it in the list), access the menu to select it as the departure or arrival for your trip. When you are done with your selection, you can close the list or start the route calculation from the "Go!" option in the menu. If you want to enter the stop names with the keyboard, an assistance screen will show up after you enter a character. The screen contains a list of matches for the text you typed: stop names starting with the string entered, followed, if you entered 3 characters or more, by the stop names containing the string (ignoring all spaces, control and other special characters). The list is updated when you type additional characters and disappears when no matches are found or the text field is empty. At any time you may scroll the list and select a stop. When you have the right one, push the trackwheel or press the "Enter" key to set the selection in the current text field and dismiss the assistance screen. When you are done with your selection, you can press the "Enter" key or use the "Go!" 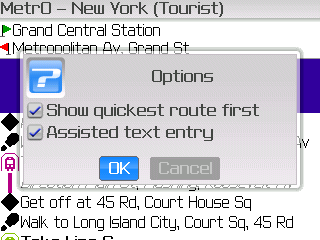 option in the menu to launch the route search. The assistance screen may be incompatible with the "SureType" technology available in some systems. In that case, you have the option to deactivate the assisted text entry feature (see below). You also have access to an history of the last 10 stops used, by pressing the "backspace" key on an empty field. As for the assisted text entry feature, you may simply select a stop in the history list..
As soon has you have launched a route search, you are then taken back to the program main screen and, after a short while, your route is displayed with all the necessary details. As with any version of Métro , you will get the fastest route and, optionally, the route with the least number of changes. The title for each route reminds the currently selected day and time and some statistics. Then follows the description of the route, with its main stops and the line(s) to take. 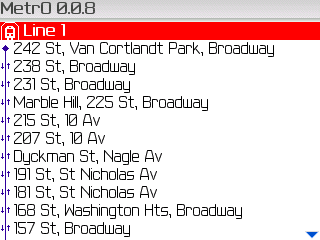 For a line section, you will get a detailed list of all stops you will run through (see screenshot). For a stop, you will get a list of the nearest PoIs as well as a list of all lines serving that stop. For a PoI, you will get more information on the place (if available in our databases) and a list of the nearest stops. Details are also available in many other parts of the program. For example, if the focus is on a the departure or arrival field in the main screen, the "Details" menu option gives you information on the stop name you have entered (if it is valid). Another example (see screenshot) appears on the stop list we have described above: here, the "Details" menu option gives access to details about the selected stop or PoI. 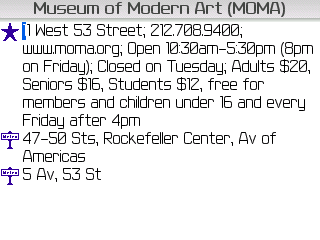 Here is an example of the kind of additional information you may expect on a Place of Interest (PoI). No action is possible in the details screen. By default, the program is searching route for the current day and time. However, in many cities, the public transportation network changes with time. 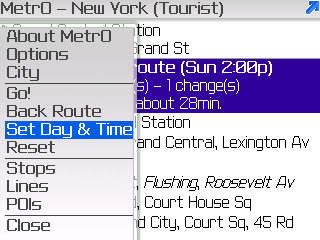 If you want to compute a route at another time, just select the "Day & Time" option in the main screen menu. In the pop-up screen, select the desired day and time from the selection list and hit "OK". Another option in the main screen's menu - "Lines" - shows a list of the available transportation systems & routes in the current database. 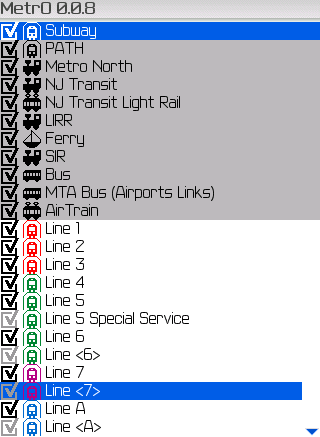 Whenever available (almost for every city we cover), the system & line names are complemented with an icon representing the type of transportation system (subway, railway, bus, tram, trolleybus, funicular, boat/ferry...), painted with the color of the line. Lines which are not running at the currently selected day & time have their checkbox grayed out (e.g. Line 5 Special Service in the screenshot). You may still change their status, however. 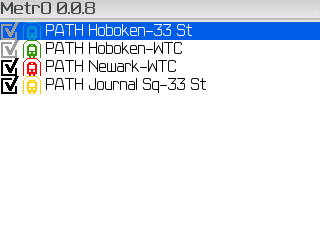 When you select the "Details" menu option while a system is selected in the list, the list is reduced to the routes in that system (in the screenshot, the PATH system was selected). The same options as in the complete list are available. When you select the "Details" menu option while a line is selected in the list, you will get a detailed view of the corresponding route (with all stops), at the currently selected day & time. The icon next to each stop name shows whether the stop is served in both directions or in only one direction. The same options as on any stop list is available here (details and selection as the departure or arrival). The checkbox on the left of each line shows whether the system or route is currently "activated". Use the "Activate" or "Deactivate" menu option to switch the status of the selected system or route. When a route is deactivated, it is not used when computing a route. When a system is deactivated, all lines in that system are deactivated (and are not used in a calculation). If a system is deactivated, the checkbox for each line in that system is shown in an "undetermined" state and its status cannot be changed. 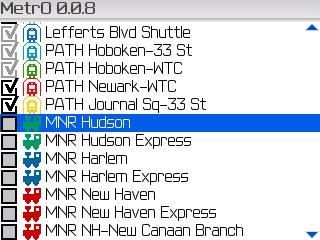 On the screenshot, the "MNR" system has been deactivated and all the MNR lines are now unavailable. The program stores your choices whenever you activate or deactivate a system (not an individual line), keeping them unchanged on your next use of the program. You can choose whether you prefer to see first the shortest route (check the "Show quickest route first" box) or the "least changes" route (uncheck the box) in the calculation results. If you don't want to use the text entry asistance or if you have activated "SureType" on your BlackBerry (which is somewhat incompatible), you can deactivate the feature. "About MetrO" displays general information about the program and the current city. You should always check that information when you open a new city. "City" brings you back to the city list that you saw at the beginning of this guide, where you may download additional files and open, update or delete your existing databases. "Back Route" exchange your start and end stops and immediately searches the return trip. "Reset" just clears the screen, erasing the start and end stop fields as well as the current route displayed (if any) and resetting the day and time to the current system time. Métro lets you record the stations and stop closest to your contacts adresses and directly use these information to search a route. Beware! If you have many contacts recorded (a few hundreds), avoid using this feature, which could be extremely slow. 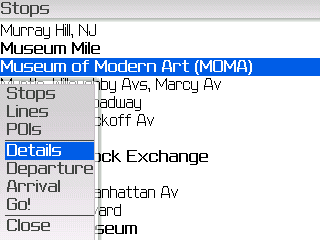 Select a contact in the BlackBerry application and switch to "edit" mode. Set the cursor on one of the available user fields. 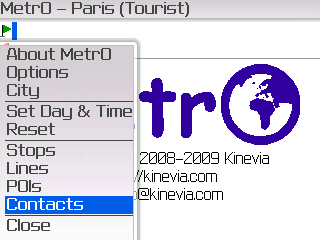 The first time, select the "Change Field Name" option and set the name to "metro". In the field thus renamed, enter the stations and stops associated to the contact address, separated by semi-colons. For better accuracy, you can add the walk time required to reach the stop, in minutes, after a '%' sign immediately following the stop name. Additionally, it is also possible to make separate entries for the home and office addresses of the contact: prefix the list with "h:" (home) or "o:" (office). If you provide both, separate the lists with a "carriage return". When the contacts are properly configured, a new "Contacts" option appears in the program main screen menu. 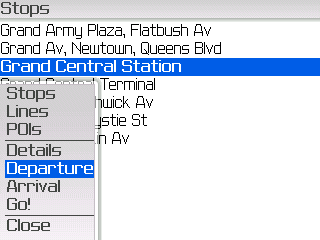 You then have access to the list of contacts, for which the stations and stops have been provided. You'll notice that two versions of a single contact may be displayed if you have provided informations for the home (marked '(H)') and office (marked '(O)') addresses. 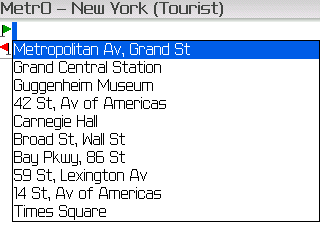 This list works like the other stop lists and lets you select a contact as start or destination point. 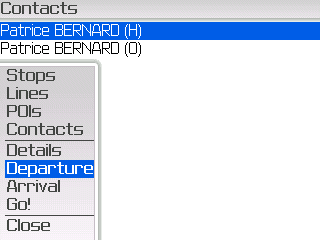 You can also directly enter a contact in the departure or arrival field: prefix the contact name with an "@" sign. Of course, the assisted entry feature is also available, if you did not deactivate it, to select a contact. When you search a route from or to a contact address, the program explores all the associated stops and suggests the otpimal solution for your trip. The detailed information for a contact shows its address and the closest stops, for the selected version (home or office). 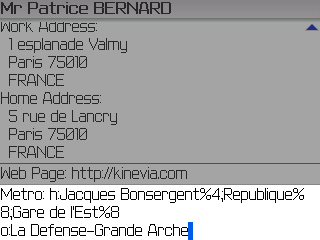 Only one adress is accessible, whatever the selection, on systems with version below 4.2.0. Connecting to the internet is not always straightforward and may even not work at all for some users. If your network connection requires authentication (on your enterprise server, for example), the program may not prompt for your codes. Until we solve this issue, please ensure you are authenticated before trying to access our servers. When installing a newer version of the software over an older one, you may be prompted to reset your device and not doing so can lead to being unable to run the program. If you ever get stuck there, we can only recommend to remove your existing version and do a fresh install. On some devices (e.g. BB Pearl), the "SureType®" feature is getting in the way when entering a stop name. Deactivating the assisted text entry feature is recommended in that case. Access to the contacts can be extremely slow if you have recorded many of them. In that case, remove the "metro" user field. On BlackBerry Storm et Storm 2, the setup screens do not show the "OK" button, making it impossible to save the options. Until I fix the problem, you can just deactivate the "legacy" (or "compatibility") mode, activated by default: go to Options / Advanced Options / Applications, select "MetrO", open the context menu and deactivate the "Legacy" (or "Compatibility") option (in some cases, it may be available directly from the context menu in the application list on the main screen). Anyone who may have a clue about these issues is welcome to contact us! Be assured we will do everything to add these features as soon as possible but, in the meantime, please don't harass us about them! 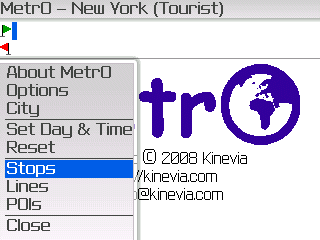 If you don't want to install the software on your BlackBerry, you may still use our "lo-fi" version of i-Métro . It requires an internet connection to work but it should consume little bandwidth. To access i-Métro , just point your web browser to http://i-metro.mobi. 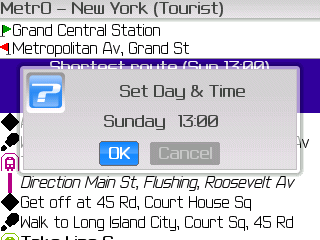 Keep in mind you can set a bookmark once you have selected a city, for faster access on your future route calculations. Copyright © 2008-2010 Kinevia SARL. All rights reserved.